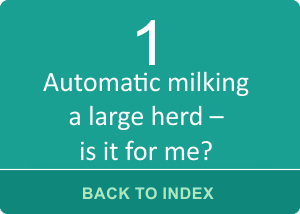 If you are contemplating a new milk harvesting system for your large herd you should at least consider the options available to you with robotic milking. The decisions you make will likely determine how you harvest milk for the next 15-20 years. The Prezi’s (slide shows) presented in this theme “Is it for me?” take you through the robotic milking options at a high level. There are four Prezis in this theme. Prezi 1 illustrates the basic differences between box robots and robotic rotaries. Click on the graphic to view the Prezi. Prezi 2 gives more detailed differences between box robots and robotic rotaries in terms of throughput, herd size, capacity for voluntary vs. batch milking, in-bail feeding and system cleaning. Prezi 3 will give you a basic overview of the impact and considerations for operation of a robotic rotary with voluntary cow traffic. Prezi 4 will give you a basic overview of the impact and considerations for operation of a robotic rotary with batch milking. The Info Sheet library contains detailed information on a range of topics. AMS Case Studies: In 2013 FutureDairy conducted labour and lifestyle audits on five commercial AMS farms in Australia.